One of the things most annoying about Hegel is his refusal to name names. I suppose he could be, like Newton in his Principia, simply snubbing the posers who aren’t smart enough to follow his argument without a few signposts along the way. That was certainly the approach of his slightly older contemporary Fichte. At least Newton was honest about it – don’t remember the exact quote, but basically when told that his explanations could be made a lot clearer, said that it would be better if stupid people just gave up left it to the smart people like him. So Hegel begins by saying people used to believe X, then people believed Y, and now, really enlightened people believe Z – leaving it to the reader to figure out that X is Aristotle, Y is Kant, and Z – well, this one he owns up to, being enlightened and modern and all – is Hegel. This Don’t Say Who I’m Talking About would be trivial except that Hegel largely avoids the terminology and descriptive methods that Aristotle and Kant use, thereby creating simultaneously a terminology mapping and argument reformatting challenge. Unlike Thomas, say, who considers it mandatory to restate his opponent’s position in terms his opponent would agree to, Hegel seems to believe that he’s doing somebody a favor by restating his opponent’s positions in his – Hegel’s – terms. What this means for the reader is that, to get 15 pages in, one must figure out who Hegel is talking about, decipher Hegel’s description, and then see if that description is a fair representation of the original argument – only then can you proceed to trying to understand Hegel’s positions. Annoying, but overcomeable. Which leads to the second issue – what I’m thinking of doing is picking out a few important representative passages, and restating them in both cleaner sentences and, where possible, in more traditional terms. This is fraught with danger, but it seems to me the only way to do that one thing Hegel is demonstrably bad at: clearly stating what he’s up to. A philosopher beloved of totalitarians, royalists, communists, national socialists, progressives, classic liberals – that’s a philosopher who has failed to be clear. That’s on him, not his serious followers. 30+ years ago, I was supposed to have read a bunch of Hegel in school. At the time – 2nd semester senior year – we had just finished reading a bunch of Kant, worked through Einstein’s Special Theory, and done other intellectually hard things that I’ve purged from my mind as a sanity-preserving precaution. After having worked diligently through Kant’s Prolegemena to Any Future Metaphysics, and plowed less diligently through Practical and Pure Reason, I kinda sorta got burned out – and so made only the feeblest attempt at Hegel. It didn’t help that, about 10 pages in, I decided (like many philosophy students before me) that I hated Hegel with the burning passion of a thousand lighter-fluid-soaked copies of the Philosophy of History. While Kant is difficult because he is a bad writer, Hegel is difficult because, frankly, he chooses to be difficult. There’s no reason to use words like concrete, abstract, subjective, objective, content and so on in ways that are so different from and sometimes the virtual opposite of the way everybody else uses those terms. And simple declarative sentences worked OK for Aristotle, Thomas and even, occasionally, Kant – there’s nothing about your ideas, Georg Wilhelm Friedrich, that couldn’t, at least once in a while, make use of them. So I’m in the awkward and intellectually untenable position of hating Hegel without ever having read him. So: Guilt. I’m reading Hegel now out of guilt. I went to the bookcases (we own a lot of bookcases) to see what Hegel we had on hand, and the first thing I found was an old cloth-bound Everyman edition called something like Introduction to Hegel – Selected Writings (don’t have it in front of me at the moment). Normally, I don’t read selections or abridgments, but I had to start somewhere and this one seemed OK, and I’m sure we have the full texts someplace for later. So: starts with a 150 page selection from the Philosophy of History. Part the Second will reveal what I found. Stay tuned. We are very fortunate to have a lovely daily Mass at Parish C at 6:30 in the morning, early enough to attend and still get to work. There was a time when such a Mass was ubiquitous in America, but not any more, especially out in the ‘burbs. One of the things I enjoy about this Mass is that the 30 or 40 people who attend every day look like a United Nations subcommittee, except with kids: We’ve got several Latin American countries represented, the Philippines, an African nation or two, India, China, Europe and the US. Also, the age spread is wonderful. We’ve got moms and dads, grandmas and granddads, some young adults and teenagers – our 2 girls come with us – and even some kids once in a while – if our 7-year old is awakened by the 4 of us getting ready, he’ll tag along. Sure, he falls asleep on the chairs pretty quick once we get there, but he’s there. We’re having a good Lent. Daily Mass, which I haven’t heard recommended from the pulpit in decades, is a very, very good thing. 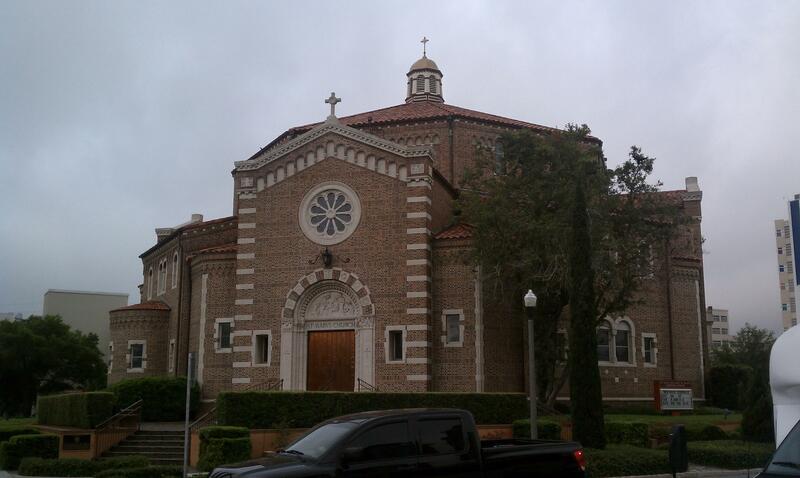 St. Mary Our Lady of Grace in St. Petersburg, FL. Interesting octagonal building. Basically an unpretentious parish church, but very nice. …writes about courage, sloth and the nature of human beings. Way better than anything I could say. I’m going to print his diagram out and explain it to the kids. Will only add that his point about sloth being the opposite of courage is something I never think about, as I waste my life away in inaction. Much easier to sit here, collect a paycheck, take an incoming phone call once in a while, and maybe do something valuable just often enough to make my employers think I’m worth the trouble. And that’s the least of it – I can go home, maybe make some dinner or read a book to a kid, but more often than not, grab a quick nap or surf the web or otherwise become unavailable to this small crowd of people I’m supposed to love. I am slothful. I am a coward. Lord help me! Since we live in a democracy, where every office holder and law is reviewable, repealable and replaceable by the will of the people, for all intents and purposes the state is the same as the people. Don’t like something? Quit your whining and change it! If this is an accurate restatement of the idea, there are two problems: theory versus reality, and time. In theory, the people could could change any law, any officeholder, any program at will, and immediately. In practice, such a democracy is most clearly represented by a lynch mob, which is why our government is not a pure democracy. The difference between our representative constitutional democracy and pure democracy is precisely this: that we, the people, cannot change anything we want whenever we want. We can only change our representatives every 2 to 6 years, we can only change laws by changing representatives, we can only change programs by changing laws. If we don’t like all these Constitutionally-provided roadblocks to direct action, and find that our representatives who hold their offices by virtue of those roadblocks don’t want to change them, we can only change the Constitution by means (a Constitutional Convention) so difficult as to have proven to be fundamentally impossible. All of these roadblocks and processes were expressly meant by the Founders and explained in the Federalist Papers to make change from the ground up so difficult and time-consuming as to be rare. All of the foregoing is still theoretical – it assumes people are playing fair. If they don’t want to play fair, voters get intimated, ballot boxes get thrown in the river, bills never get to the floor because somebody got paid off somewhere, bureaucracies – the modern Praetorian Guards – fund election of people who will guarantee that they always have a job. We have the perfidy of people on top of the safeguards against mob action as sand in the gears of change. Now imagine I have a 5 year old and am ready to send her off to public school when I read this. Now, under the State is Us rules, all I have to do is replace the NEA policy with one that is tolerably sane. Meanwhile, my child will have spent 12 years in a system governed by the insane policy, taught by people who, at best, cant’ openly defy such policies, and, a worst, actually believe such policies are correct (or don’t go far enough!). In fact, even if i were willing to devote my entire life to opposing this policy, and had success in recruiting millions of people to the cause AND the other side played fair (like that’s gonna happen), I’d be more likely to be babysitting my grandchildren than to have seen material change before my kids were out of school. So, at the very least, I should hope that the State is Us crowd would recognize that, even if they are right, the time frames over which change can happen are such that lifetimes – your children’s lifetimes, in this example – would be wasted before any change took place. All of the above assumes a fantasy world in which Machiavellian power struggles and utter deceit and craven greed don’t have their say. In this world, they not only have their say, they drown our every other sound. Author Joseph MoorePosted on March 31, 2011 March 31, 2011 Categories Schooling, ThoughtsLeave a comment on The State is Us? That I would fee compelled to throw up a post like this is a prime symptom of what I’m talkin’ ’bout. Namely: There are, it seems to me, lots of little bad ideas or commonplaces or, well, canards that live happy, comfortable lives, lolling around in public, catching rays – that ought to die. Right. Now. My response to this overpowering urge to abbreviate the lives of certain ideas is to drag out some heavy artillery and start blasting, going after the mouse with an elephant gun, blowing holes in the walls, etc – generally, making a fool of myself. Good thing I really need to be made foolish, for the salvation of my soul. Then – here’s where this post comes in – I then feel compelled to explain and defend whatever odd position I’ve taken today. And then apologize, hope that I haven’t hurt anybody’s feelings, and say I’m not really an ogre, I’m polite and housebroken and everything. Small children and dogs like me! No, really! I call this Channeling My Inner Pedant. Probably half the posts here are nothing more than that. In my heart of hearts, I really believe that the world would be a better place if we never heard the term ‘paradigm shift’ again; if people got a clue about what science can and cannot tell us, if no one ever again uttered the phrase (or entertained the notion for more than 2 seconds) that ‘the government is us’; and a million other little tiny crawly creepy vague and/or dumb ideas. Ya know? Of course, I could be wrong – but if I didn’t think I was right, I’d, like, change my mind. But way more than enough about me.